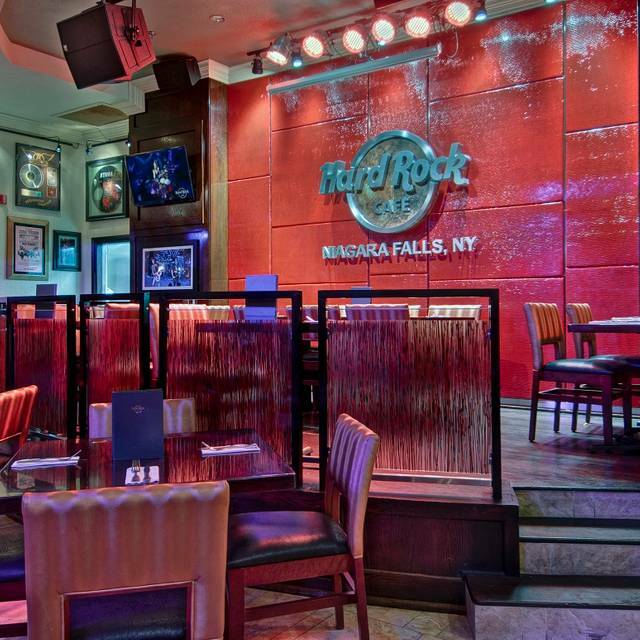 Hard Rock Cafe Niagara Falls USA offers our catering services year round to many locations in WNY. Our full catering menu is available upon request and can be customized to meet any clients need. No matter what type of event you’re planning, it will be unforgettable. 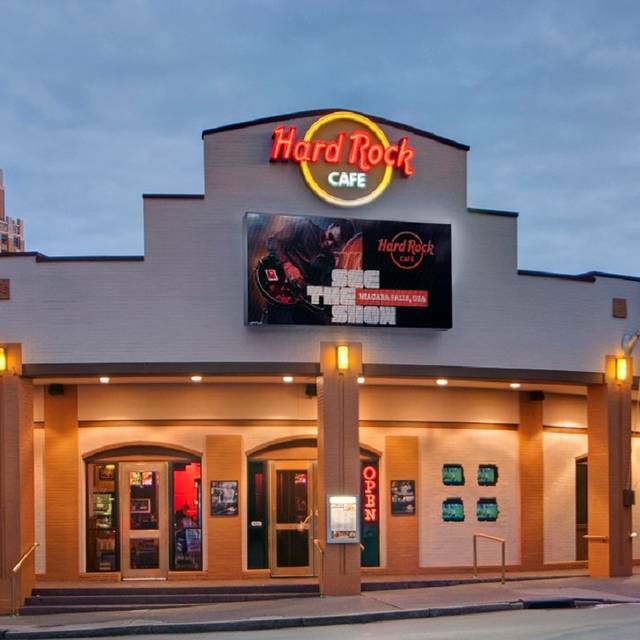 Niagara Falls USA New York, has long been the destination of honeymooners, and now it has another special place in the hearts of music lovers – it’s the home of Hard Rock Cafe Niagara Falls USA. Our cafe is located just minutes from Niagara Falls State Park, which consists of three amazing waterfalls: Niagara Falls, Bridal Veil Falls, and American Falls. The Niagara Falls Observation Tower, Niagara Adventure Theater, and starting point of the Maid of the Mist Boat Tour are also just minutes away. 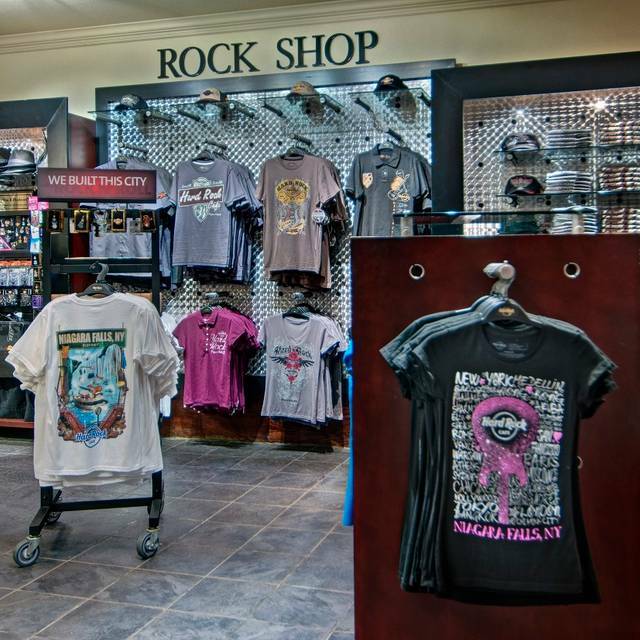 After you’ve worked up a little hunger or thirst exploring the Falls, come into our cafe for delicious food, Hard Rock shopping, and great live entertainment. Our classic menu can't be beat, and every kind of liquid treat you desire is yours for the asking. 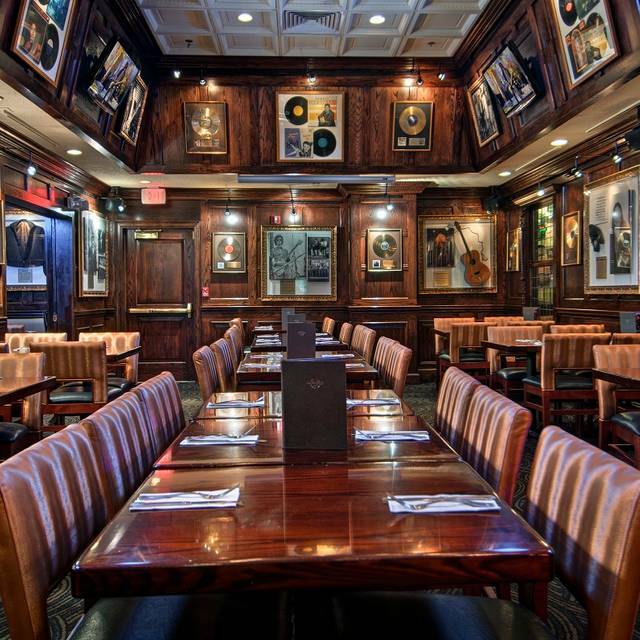 Boasting a grand, old American-style collection of memorabilia from rock legends, we have it all at our cafe in Niagara Falls, New York. Bring your Amigos and celebrate with us! We will be featuring our Tropical Margarita and Rockin’ Fresh Margarita along with our limited time Tequila & Lime Infused Fajitas starting Wednesday, May 1. EVERY MUM IS A ROCKSTAR! Celebrate her. Spoil her. Join us for lunch, dinner or cocktails to celebrate your amazing mom on Sunday, May 12. Treat Dad to all his favorites.. Steak, Burgers and Beer! Join us for Father's Day Lunch or Dinner. We attended a high school band night. The manager was super friendly and helpful when i reserved a table. He said you are in a side room but you have video monitors. Great. Except the video looked like warped vhs from the 80s. I think hard rock might be able to buy a few nice TVs? Room was super tight and staff was constantly trying to get around the room. Other parents decided to plant themselves in the doorway and block everyone else’s little view we had of the stage. Food is ok but overpriced. Service was great. went for a school jazz band concert. considering how many people all came at once, the service was outstanding!! We went there for our son’s Jazz band performance. 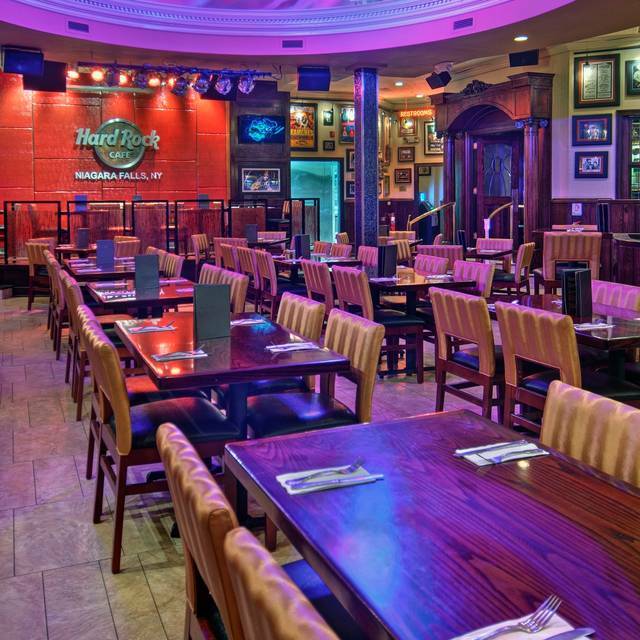 The place was filled with families looking forward to hearing the band in a friendly and rock n roll themed restaurant. My cob salad was really good. I enjoyed the pomegranate seeds and seasoned pumpkin or some type of seed that was on it. You can have it your way. My husband had the legendary burger that came with fries. It was cooked well as he had requested. The presentation and taste were very good. They were originally supposed to have a special menu for us but a computer glitch had us ordering from the main menu. It worked out well because I tried something different. The management provided a discount which was appreciated. Really nice place for a bustling musical Tuesday evening with good food and friendly staff and management. I thought the food was kind of pricey, but I understand it's a tourist area. I ordered the pull pork sandwich and there was a huge chunk of non-edible meat in the sandwich. Kind of grossed me out. Our server was outstanding. Jazz concert was incredible. We always look forward to this yearly event. Great music with a great atmosphere. Food was fresh and hot. Had not been to this particular Hard Rock. Reservations for one were easy to get on a busy Saturday night. Caesar salad was the best thing that I had and could have eaten three. The chicken tenders were a small portion for $18 and they were so well done there was char. Char is the worst and it ruined the tenders. The French fries that came with them tasted reheated and were totally underwhelming. Free soda refills, the Caesar, and the decked out restaurant decorations made this an okay stop. Would not return. Rainforest Cafe is next. Good salmon and shrimp. Wasn’t crazy about the Mac and Cheese but my wife’s steak was good as was my daughter’s flat bread pizza. Not what I remembered. The service was great but the food was lackluster. If you go for the atmosphere, then you’ll have a much better time. We just went for the food, so not that great. When we arrived to a mostly empty restaurant and i asked for a booth the "hostess" replied "not for three people" and was then motioning to a 4 seater table near the door! When i said we didn't want to sit near the door since it was 30 degrees and extra windy out and asked if we could sit in a half booth near the window she said nothing, grabbed 3 menus and walked toward the table. We followed but didn't sit down since it hadn't been cleaned (again, in an almost empty restaurant). When i motioned towards the pile of fries napkins and crayons on the floor where our feet were going to go, she rolled her eyes again saying nothing and then disappeared. We stood for 3 minutes contemplating leaving but since our son was hungry and we weren't sure what else was open in that immediate area, we reluctantly stayed. She came back with a broom and haphazardly cleaned the floor, didn't bother wiping the seats down. Luckily i had some napkins in my purse and did that myself. The group next to us had an issue with their food so we had to listen to them over the music. Food wasn't up to other HRC standards by a long shot. All in all it was a very disappointing experience on St. Patrick's Day! We'll continue to visit the falls a few times a year as well as other HRC locations, but we will NEVER go back one. Also, bathrooms were not clean and no paper towels in women's. This staff just looked hung over and like they wanted to ne anywhere but working there to be honest. Nice that Hard Rock supports local live music. Performing Arts show was a great event at a fantastic venue for the kids. Thank you for following up and sending this survey. That’s a sign that you want to make things better. We were there only because my granddaughter was one of the performers with the Performing Arts School. Here are my reasons for my ratings: 1) Making our reservation was quick and easy. 2) The hostesses weren’t especially warm and/or friendly, 3) It took a very long time for the waitress to take our food order, and really long for the food to arrive at our table, 4) my order was wrong, so I had to wait a bit longer to get what I ordered, 5) Our waitress wasn’t very attentive or friendly, 6) I ordered the Waldorf Salad, which wasn’t tasty, but the chicken that came with it was grilled to perfection! The Waldorf Salad wasn’t anything like a traditional Waldorf Salad (Google it to see what it should look like, which is what I expected). The chef needs to take the time to properly cut up all ingredients, so the flavors blend well. 7) We didn’t like the fact that after the waitress gave us back our credit cards, with the completed check, she disappeared. We didn’t want to leave our check information on the table, so I walked it over to the kitchen area and handed them to a waitress. So as you can see, our overall experience wasn’t very good. We did like the personalized table place holder, though. Thanks for the nice souvenir! Our table was ready for us when we arrived. We were brought to our table quickly but waited at least 10 minutes before the waiter came over-just to tell us his name and that he'd be back to take our order. The big problem was that the Hard Rock was having an open mike for a local middle school. I checked the events calendar prior to making the reservation and there was no mention of this event on the calendar. After giving us time to think about it without any attention from the wait staff and after realizing that several young students were going to be singing throughout the evening, we decided to leave. Had we known about the event, we would have chosen to go there another day. To sum up: Update your events calendar! We had a delicious meal, the wait staff was very courteous. We had excellent service, great food at a reasonable price, a fun atmosphere and a beautiful night at the Falls! Highly recommended! Brought an out of town guest to see the falls and out for a casual dinner in a great atmosphere. Could not have been happier or more impressed. Will recommend to friends. Thank you! 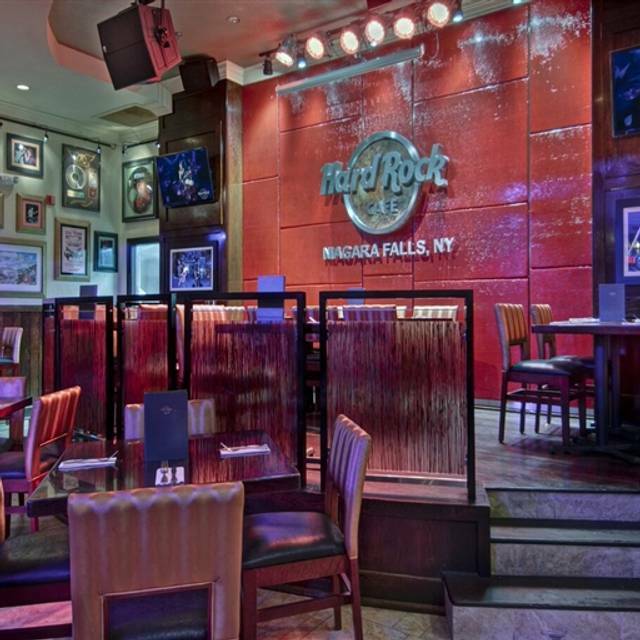 Once again we had a great experience at Hard Rock Niagara Falls NY. Excellent service and delicious food. My husband has a few dietary restrictions and it was no problem for Hard Rock to accommodate him. We will most certainly return again! Got the NY Strip. $26 and was as good as $50 steaks I've had. Everything was great. Clothing and jewelry priced good also. The food and service were great. I only wish the were more metal displays although I really enjoyed the Megadeth jacket and Izzy shoes. Great meal and environment for families! Just very expensive for the simple meals we purchased. Once again had a great meal with wonderful service!! The food, service and atmosphere were fantastic!! Music is way too loud. Most of the food we ordered was great, but the Nachos were stale and expensive. They didn’t have our reservation but found us a table right away. Very accommodating. Waiter was great!!! No complaints! Great dining option in Niagara Falls! We encountered an issue with one of our meals, and Lauren, our server, and Sean, the manager, took care of it quickly. Other than that, it was a good experience. The food and service were great. We enjoyed the atmosphere and music during our meal. It was a little loud but due to the type of restaurant it was appropriate. I’ve been coming here for 21 years! They never disappoint. I keep telling everyone they have the most underrated steaks in town. It’s not a tourist trap as they cater to the locals and that’s a bigger bonus. I’ll keep going back over and over. Also, try the bruschetta bread!! We enjoyed lunch at the Niagara Falls Hard Rock today. The food was amazing. The hostess and servers were courteous and attentive. We will definitely be back! Great customer service. Food could have been better; but overall it was a great experience; specially as a Christmas Eve dinner. The food was great, they were very accommodating as we were with the band.